This marks three straight shutouts for the T-irds. Holy power failure, Batman! The frustration appears to be mounting. Throughout the game they had two 10-minute misconducts and two game misconducts. Kyle Becker had a 5-minute major for charging late in the 3rd period and backup goaltender Patrick Dea got the heave-ho at the final whistle. Byron Spriggs earned the shutout and win with 23 saves. A shorthanded goal by Sean Christensen and a last minute powerplay goal by Keaton Jameson providing the offence. For both it was their 2nd goal of the season. Rylan Toth took the loss with 20 saves. It appeared that the Bison line-up was exactly like what they had on Saturday last weekend. 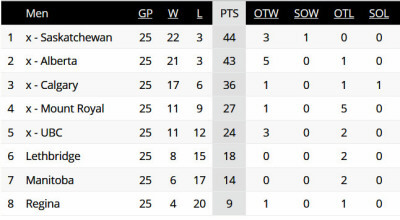 Now, with three games left on the schedule the Bisons are four points out of a playoff berth. Saturday's rematch is on at 12:30 PST or 2:30 PST and can be seen on CanadaWest.tv. The Kootenay Ice are moving to Winnipeg next season and will play two seasons at the U of M whilst their new arena is constructed. There will be some upgrades to the Wayne Fleming Arena, which will be a lasting benefit to the Bisons. Also, the new facility would make a wonderful U-Cup venue. This was a double overtime nail-biter. Taran Kozun only had to make 14 saves for the shutout. Riley Morris's 44 saves were not enough as he suffered a hard-luck loss. Levi Cable's 13th goal of the season was the winner. Bedrock U throttled the Kittens, holding them to just 11 shots on goal, including just one in the 3rd period. Regina will need a night of moonshine and banjo music to recover from that. Matthew Greenfield had a 10-save win and Dawson MacAuley had a 40-save loss. Coda Gordon scored two goals and an assist and Riley Sheen had four assists to pace the Dinos. The Hørny Ønes were dominated by the Evil Monkeys, which was good news for the Bisons. The Monkeys jumped out early, outshooting Lethbridge 23-5 in the 1st period. Down 4-0 heading into the 3rd period, the Hørny Ønes raised no fuss in the 3rd period, being outshot 17-3. Zach Sawchenkoi got the win with just 14 saves, and Garret Hughson stopped 53 shots for the loss. He must be tired heading into the rematch. Rather than being played last weekend, this year's Crowchild Classic got pushed to Tuesday night at the Saddledome. As usual, the game drew a massive crowd. The game was as close as possible. The shots were 31-30 for Bedrock U, and the final shot was the winner, scored by Riley Sheen (his 16th of the season). Matthew Greenfield got the win and Riley Morris took the loss. Feb 02 Carleton at U.Q.T.R. YOU DESERVE TO SEE CANADA'S BEST!